Accumulator Insurance Offers | How to make a profit on every accumulator! Accumulator insurance offers are a great way to increase your profits when matched betting. There’s a number of online bookmakers who offer accumulator refunds which gives multiple opportunities to make money. Accumulators are generally a bit of a gamble. They require you to predict the outcome of several events in order for your bet to win. However, with the addition of accumulator refund offers, it is possible to make a profit on EVERY accumulator you place. There are a few different ways you can make money from ACCA insurance offers and we’ll go through each one in this article and explain the pros and cons of each method. Accumulators (or ACCAs as they are also known) are a combination of single bets where all of the selections have to win for you to win the bet. You may think that Arsenal, Chelsea, Man City, Everton and Liverpool will all win their games and place a £10 accumulator bet for that to happen. For you to win the bet, all 5 teams you have chosen must win their matches. If any of the team lose, you will lose your bet. The odds for accumulator bets are much higher than a single bet as you are replying on multiple chosen events to happen. To work out the odds for an accumulator, simply multiply them together. Using the example in the screenshot to the left, the odds are 1.4 x 1.18 x 1.4 x 1.7 x 1.57 = 6.18. Therefore, the odds for all your chosen teams to win and for your accumulator bet are 6.18. If you were to place a £10 bet on this accumulator, you would return £61.88 if all selections won. What are Accumulator Insurance Offers? The terms and conditions of accumulator insurance offers vary slightly between bookmakers but they mostly follow the same general rules. The bookmaker offers a refund of your stake, as a free bet, if one leg in your accumulator lets you down. So if Man City fail to win at Brighton but your 4 other chosen teams win, you would get a £10 refund as a free bet. Bookmakers love customers placing accumulators as they are good value for them given the generally high odds they are placed at. However, using matched betting, customers can use ACCA insurance offers to make a consistent profit on every bet. To make sure we have the best possible chance of either our accumulator winning or one leg of our accumulator losing, we need to find the most suitable matches to add to the accumulator. The aim is to put together an accumulator with the lowest combined odds whilst staying within the terms of the accumulator offer. For example, if the terms of the offer are that cumulative odds of the accumulator must be at least 3/1 then we aim to combine matches which add up to as close to 3/1 as possible when put in an accumulator. Scrolling through every football league in the world each day will take forever and probably won’t be worth the effort and so it is best to use a matched betting service like MatchedBets or OddsMonkey who have developed matched betting tools specifically for accumulator refund offers. Alternatively, you could try Mike Cruickshanks stand-alone acca product Accumulator Generator. You can try out the software for £1 for 14 days by clicking here. 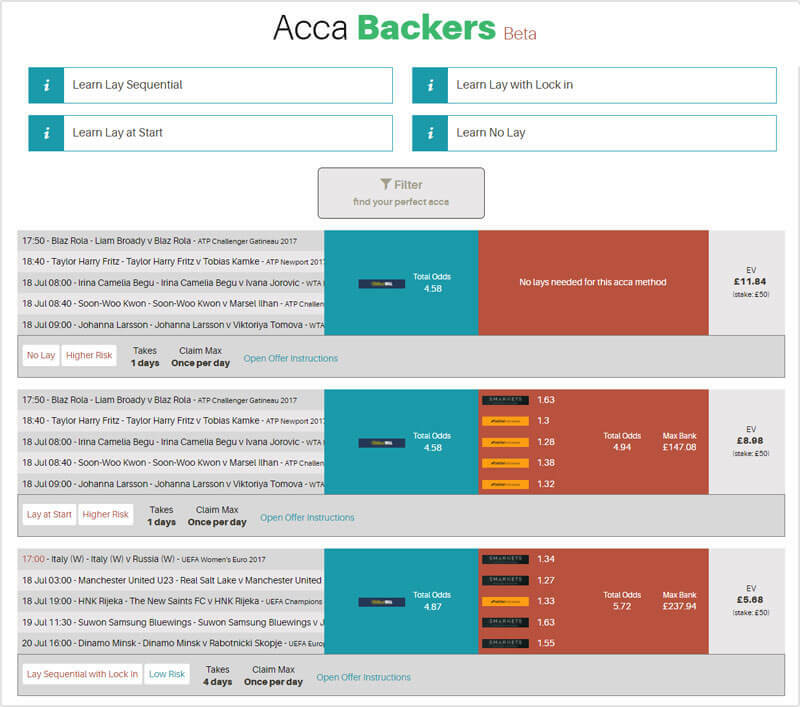 Below is an screenshot of the ‘AccaBacker’ tool from MatchedBets.com. It automatically generates the most profitable accumulators for each bookmakers accumulator refund offers. The terms of each offer are pre configured into AccaBackers so it will only display eligible accumulators for each specific offer. Tools such as AccaBackers will save you hours in finding good matches for your accumulator and with all of the other tools and features you get with a matched betting service such as MatchedBets, it’s a no-brainer for £14 a month. Considering each accumulator is worth on average a little over £11 profit, you’ll make your monthly subscription fee back after completing just a couple accumulator offers. There are four methods you can use to extract value from acca insurance offers. Each one may take a little bit of learning if you have never done them before but they are worth learning considering the profit you can make from them. 1. All your selections win. You have won your accumulator and you can collect your winnings from the bookmaker. 2. One of your selections loses. You will receive a refund of your stake as a free bet. You can then use the normal matched betting strategy to extract roughly 80% profit from your free bet. 3. More than one of your selections loses. You do not receive any winnings or a refund. Using an accumulator tool such as AccaBackers will allow you to pick games that are the most likely to win. Therefore you have a good chance of either winning your accumulator or receiving a refund as a free bet to minimse your losses. The no-lay method takes advantage of the positive EV (Expected Value) that Acca Insurance offers give, meaning that you will make a profit on average with this method. However, this method is not risk free and it is possible you may go on a losing streak. Overall though, you can expect a profit over time with this method. The ‘Lay at Start’ method is also relatively easy and takes minimal effort. This method requires you to lay each of the selections in your accumulator before any of the matches have kicked off. Again, this method isn’t risk free but it does have a positive expected value, meaning you will profit over time from this method. You will generally make a profit using the ‘Lay All’ method if all the matches in your accumulator win or if two or more selections lose. If only one of your selections fail to win, despite receiving a refund as a free bet, you will make a loss. Similar to the ‘No Lay’ method, you can choose matches which overlap in times. For example 2 or 3 games which kick off at 3pm. You can do this as you do not have to lay each game as they finish, as is the case with methods we will explain below. This means that your accumulators look very natural to bookmakers and so you have less chance of your account being restricted or ‘gubbed‘. This method is quite unpredictable but it can see very big returns should a lot of your legs lose. The Lay Sequentially method requires you to lay each match until one leg loses. If this happens, you then continue to lay at a reduced stake until a second leg loses. The use of a spreadsheet is required with this method as you need to work out the lay stakes depending on the outcome of each match. MatchedBets have a spreadsheet which you can download for when using this method. As you need to lay each game before it has started and after the previous game has finished, you will need to choose matches which are at least two hours apart. Thankfully, the AccaBacker tool does this for you and so you don’t have to spend time looking for games kicking off at specific times with good odds. With this method you will only make a loss if one of your selections loses. All other outcomes will return a profit. Lastly we have the ‘Lock-In’ method. This method is essentially risk-free and works in a similar way to the Lay Sequentially method. The Lock In method again requires you to lay each game one by one. However, with this method you are leveraging the value of the free bet in your lay stakes and so are not at risk of making a loss. As you will not be at risk of making a loss, your expected winnings are reduced slightly compared to other methods. Again, you will lay each match until one selection loses. At this point you will lay a reduced stake for the next matched until another selection loses or the accumulator has finished. You will need to use a different spreadsheet to the one used for the Lay Sequential method as different lay stakes are calculated when one leg has lost. Deciding on which method to use depends on a few factors. If you aren’t going to be available between the matches in your accumulator then you should use the No Lay or Lay at Start methods. However, these methods will return a higher profit. If you do have the time and a slightly larger bank, then the Lay Sequentially and Lock-In methods may be best as they are lower risk. Whichever method you choose, make sure you start with low stakes until you are comfortable with each method. Once you get the hang of things you can increase your stakes and aim to make a bigger profit. How much can you make from Acca Insurance Offers? There are numerous acca insurance offers to complete each week and so it really depends on how many you have the time to do and how much bank you have to do them. Each £50 offer has an expected value of around £11 and so the potential to make several hundred pounds a month from accumulator offers alone is definitely achievable. MatchedBets currently has 10 bookmaker accumulator offers pre configured into their AccaBacker tool which gives customers excellent opportunity to boost their matched betting profits with accumulator offers if they are not already doing so.